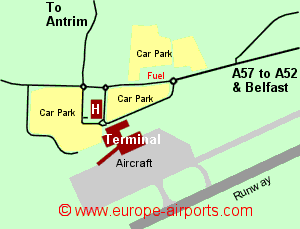 Belfast airport has one passenger terminal which was significantly enlarged and improved in 2004. Ample car parking is located within 500m of the terminal building. There is a 24 hour bus services between the airport and Belfast city with buses leaving every 15 minutes during daytime at a cost of 7 pounds and there is also a bus service to Londonderry. 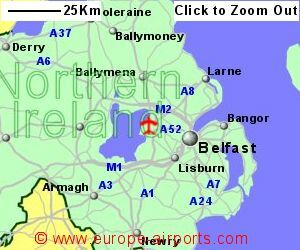 The nearest train station is at Antrim, 9Km north of Belfast airport where there are train connections to Belfast, Lisburn and Derry. Fast train connections to Dublin are available from Belfast City Central station. A taxi into Belfast will cost approximately 35 pounds, 12 pounds to Antrim train station. 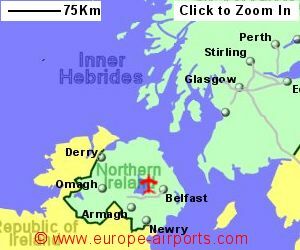 Belfast International airport has 6 bars/cafes/restaurants, 8 shops, currency exchange, ATM's,2 currency exchange facilities, a business lounge, and FREE (for 2 hrs) WiFi Internet access. A fuel station is on site. There is a 4 star hotel with conference facilities on the airport site. In 2017, 5.8 million passengers passed through Belfast airport, the busiest in Northern Ireland, representing an increase of 13% from the previous year.